Even with enough memory Windows can come to a halt again. The culprit is the clumsy distribution of process priorities on Windows. With the right freeware you here but to improve. Each program is running on Windows with a specific priority, regardless of whether this is the browser, mail client, or media player. By default, comes all non-system processes to a normal priority. Typically, this process is not a problem, but it can at peak load times (including when the backup program starts up) get to bucking. Process Lasso ** automatically distributes the processing power and priority according to rules. In the free version, however, the registration reminder interfere. Our alternative ** Bill2's Process Manager also distribute the process priority - and all without nagscreen. We provide the process manager. Download Bill2's Process Manager (link below this post) down, install and start it. Even if you during installation "english" have chosen the language, you still need to change the language once the program menu itself. Click to Options, Change the drop-down menu (bottom left) english, was waiting just reloaded to the program and click OK.
Now we create a first rule for Firefox. It is our desire that the Mozilla browser is always performed with the highest priority. Start to Firefox. If you have not installed the browser can download Mozilla Firefox here. He is then displayed in the process list. 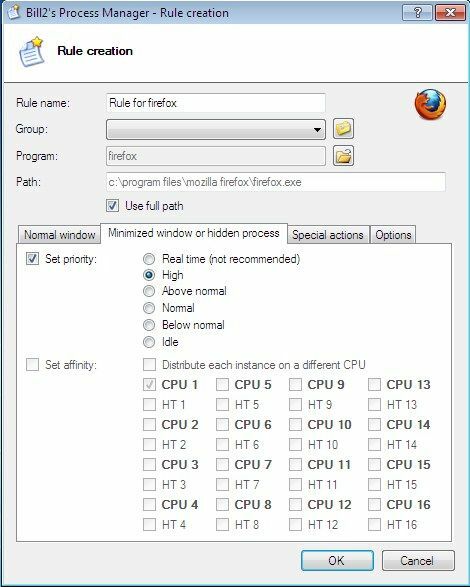 Click with the right mouse button firefox and then Create a rule for this process. Under the tab "normal window" activate the option Set priority and select High out. Go to the tab Minimized window or hidden process and here again successively on Set priority and High. We would also not be disturbed by tooltips. Just activate the tab Options and enable the options Do not show a tooltip When priority or affinity is set and Do not show a tooltip When applying automatic priority. Accept the settings with OK. 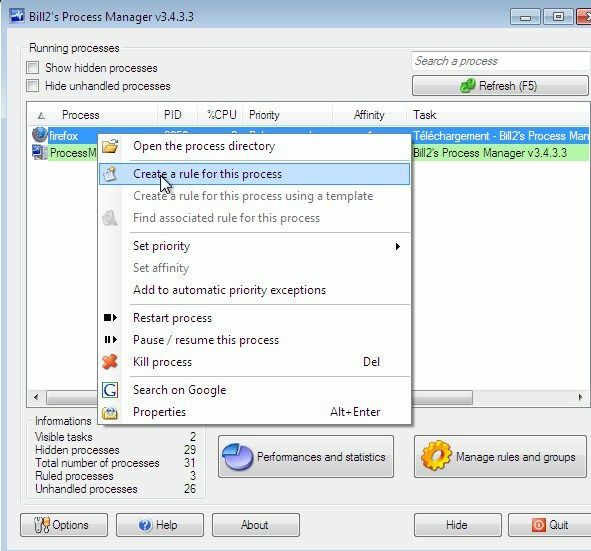 Some programs do not appear immediately in the process list of Bill2's Process Manager. It may be the backup program that is carried out at a certain time and runs in the background. But such processes can be prioritized automatically Bill2's Process Manager. Wait is executed until the desired task. Under the main window "Running processes" the functions Show hidden processes. Enter a part of the process name in the upper right search box. Once Bill2's Process Manager will find it, click with the right mouse button on the process and call Create a rule for this process on. Now you can use the tabs "normal window" and "Minimized window or hidden process" specify the desired prioritization. Enable each tab option Set priority and define the priority level. Accept the settings with OK. 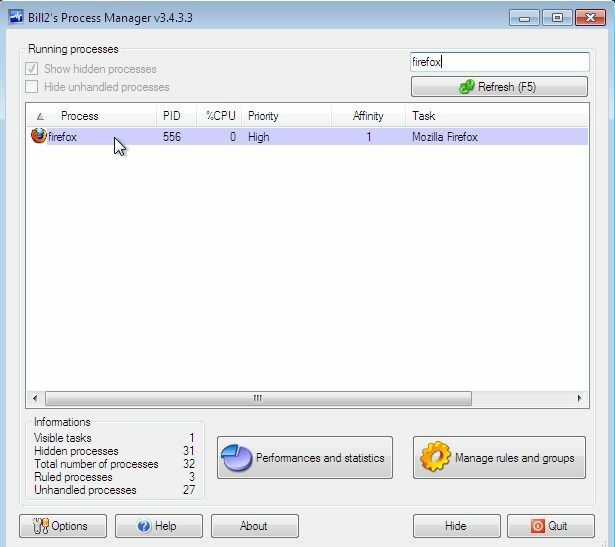 If the process is very heavy load on the system resources, so you can limit the number of CPU cores used with Bill2's Process Manager. Under the previously described function "Set priority" the option Set affinity and (de) activate any number of CPU cores. The program then accesses example only return to the cores. 1 and 2 An example: The browser uses only core 1, while the backup is running on the cores 2,3 and 4. FIG. Thus stuttering be minimized. With these first steps, you have come a little closer to the judder system. not expect, however, that the settings are perfect. Depending on the amount of RAM and program utilization you need to experiment with the settings and find the optimal balance. So it may be that you still need to set a higher or lower priority for an application. Try it!